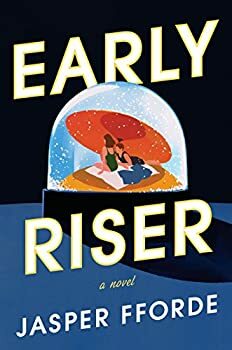 Jasper Fforde offers up his trademark sardonic wit in his new novel Early Riser (2019), though it’s more chuckle-worthy than laugh out loud and has several issues that relegate it to the category of a lesser Fforde. I was, to be honest, a bit disappointed, at least partly because I so love much of his earlier work, but despite that disappointment, the book still manages to (just) tip on the side of being a worthy read. Early Riser is set in a world (limited to Wales for the novel’s plot) where the human race hibernates through each brutal winter, save for a stalwart group who does all the necessary work to keep the world working and the sleepers alive. This isn’t some recent apocalypse; in this universe, winters have always been far worse than our own, ice sheets cover much of the north, and humanity evolved millennia ago as hibernators. It’s a brave new world now, though, with the “dormitoriums” warmed by nuclear piles now rather than fires. And where the Big Pharma company HiberTech distributes a drug called Morphenox that has greatly increased the chance of surviving the winter sleep for the 50% who can afford it, at the cost of dreaming, which is not considered a downside. On the other hand, the clearly negative side effect is that one of every 2000 Morphenox users ends up in a zombie-like state, or in this world’s terminology, nightwalkers (though in good capitalistic fashion, these are “redeployed” as the most menial of laborers until they get “farmed out” for parts). Besides the lethally-harsh winters and the nightwalkers, there are also villains (bandits who often strike at pantries of stored winter food) and, maybe, wintervolk — rumored monsters that stalk the winter night. Into this world steps Charlie Worthing, a newly hired member of the Winter Consul (the law enforcement agency during winter sleep) who ends up stranded in Sector Twelve, on the periphery district that is home to many of the worst wintervolk stories, as well as an assorted group of odd residents, the strangest of all being either Toccata, the chief of the Winter Consul, or her bitter rival, Aurora, head of security at HiberTech. The plot, a bit of a surreal thriller/mystery, is convoluted but mostly well-structured and set up, though one can predict where it’s eventually heading pretty early given the story’s basic elements. And the side plot about whether or not the wintervolken truly exist was a nice addition that offered a somewhat more interesting and fantastical mystery. In the issues column, the characters are a bit shallow, feeling more as if they’re constructed as humor props than actual people. Even Charlie is a bit bland, a bit too passive and random for my preference, and, as well, too oblivious to what appears to me to be a pretty clear demarcation of which side he should be on. And while the worldbuilding is often funny and vivid, and can be sharply biting, it threatens to overwhelm the plot at times, especially in the first third or so of Early Riser. Fforde throws a lot of jargon at the reader, as well as some huge chunks of exposition. Pacing is further thrown off by the throw-a-lot-of-stuff-at-the-wall-and-see-what-sticks mode of humor. A bit more judicious paring of jokes, pop references, and maybe some work streamlining a plot that was both overly-convoluted and a little too predictable would have helped smooth things out and let the good stuff shine a bit brighter. In the end, I felt there was a great story in here trying to get out, but it kept getting entangled in all those issues of plotting and characterization. As I said at the start, I do think Early Riser is worth a read. When the humor works it’s quite good, and the world is both freshly original and also thoughtful in its satirical nature. You just, like Charlie, have to put your head down and slog through a few rough patches. Published in February 2019. 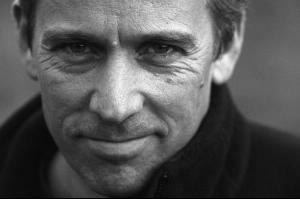 The new standalone novel from bestselling author Jasper Fforde. Every Winter, the human population hibernates. During those bitterly cold four months, the nation is a snow-draped landscape of desolate loneliness, devoid of human activity. Well, not quite. Your name is Charlie Worthing and it’s your first season with the Winter Consuls, the committed but mildly unhinged group of misfits who are responsible for ensuring the hibernatory safe passage of the sleeping masses. You are investigating an outbreak of viral dreams which you dismiss as nonsense; nothing more than a quirky artefact borne of the sleeping mind. When the dreams start to kill people, it’s unsettling. When you get the dreams too, it’s weird. When they start to come true, you begin to doubt your sanity. But teasing truth from the Winter is never easy: You have to avoid the Villains and their penchant for murder, kidnapping, and stamp collecting, ensure you aren’t eaten by Nightwalkers, whose thirst for human flesh can only be satisfied by comfort food, and sidestep the increasingly less-than-mythical WinterVolk. But so long as you remember to wrap up warmly, you’ll be fine. I had been waiting for this book for years — it was constantly being postponed — when one day last summer I checked Amazon UK on the off chance and found that it had just been released. I ordered it immediately. And well, all I could think of while I was reading it was how sad it was that all this effort and creativity was not put into Shades of Grey 2: Painting by Numbers instead. Shades of Grey is one of my all time favorite books and I gather its planned sequels will never be written because it was a poor selling book. What a shame. As for Late Riser, I agree with your review. It seems like he had this premise, but couldn’t quite find the story in it, and he so kept adding layers and layers on to the premise without adding much to the underlying story.